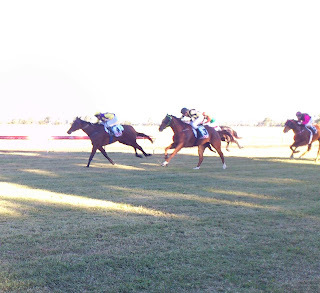 Trooprock Aussies: Thangool Race day! Thangool starts to get a lot cooler during May, plenty of rain and Queensland's coldest day recorded definitely pushed us towards the decision to get back to the coast and move up north soon! Our final day was to be Race Day the 25th of May. Jeni and I were yet to attend a Race Meet, but we got into it like anyone who attends the races. We dressed up nice and went out with a smile. Ended up having a win and up 10 bucks for the day! 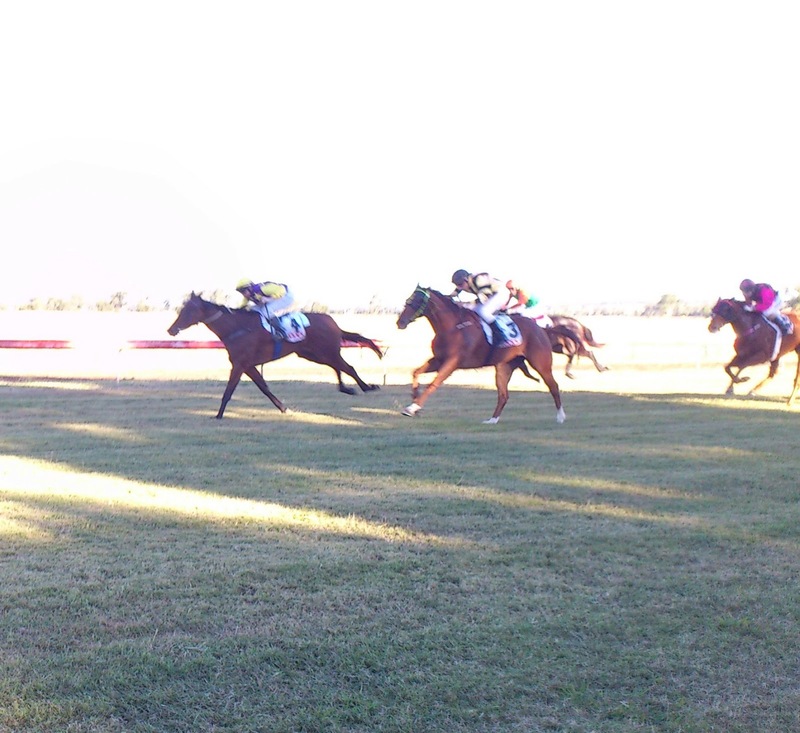 Our winning horse for his race, Tropic Gem, was quite the entertainer, throwing his jockey off and bolting off the racecourse while the rest of the horses lined up. Top horse, scored me a win, would like to buy him an apple sometime. We put a few bets on, playing pick the horse with the cool name and then pick the best booky for a few hours. A lot of people were dressed up over the top, like our good selves, although quite a few blokes were sporting the humble flanno, wielding tinnys and stumbling around. I personally found great humor in watching the horses prepare for their races whilst they bucked, pooped and pumped themselves up pre-race. Tropic Gem for the win! After the final race for the day, Jeni and I returned to the Party Bus, ready to take punters to the Hotel Thangool Races After Party - Wooo! During the ride back I was treated to some kind of Blues Brothers tune thanks to my John Belushi like getup, quite inspiring indeed! Back at the pub we served a variety of race/Trooprock themed cocktails and shots needed for a great after party. Was a great turnout for our final night at the pub. Once we closed the doors we sat around the fire for a few sneaky ones and also discovered a really cool s'more-like treat by popping hot marshmallows between a couple of Nestle choccy bickies! Very nice! The races were great fun, as was the after party and the after after party! Had a great time at the pub, but well looking forward to beginning the next step in our adventure tomorrow morning! "Troopy Fuel" - rum, vodka, tequila, Galliano topped with coke and a few splashes of tobasco!